Perovskia atriplicifolia, Russian Sage, has beautiful highly textured silver or grey foliage that makes a great addition to most any sun garden. Spires of blue flowers are produced late-spring through fall and are frequented by bees. Russian Sage is a striking addition to rock gardens, perennial borders, and xeriscape gardens. This attractive perennial thrives in full hot sun, but can tolerate some light shade. 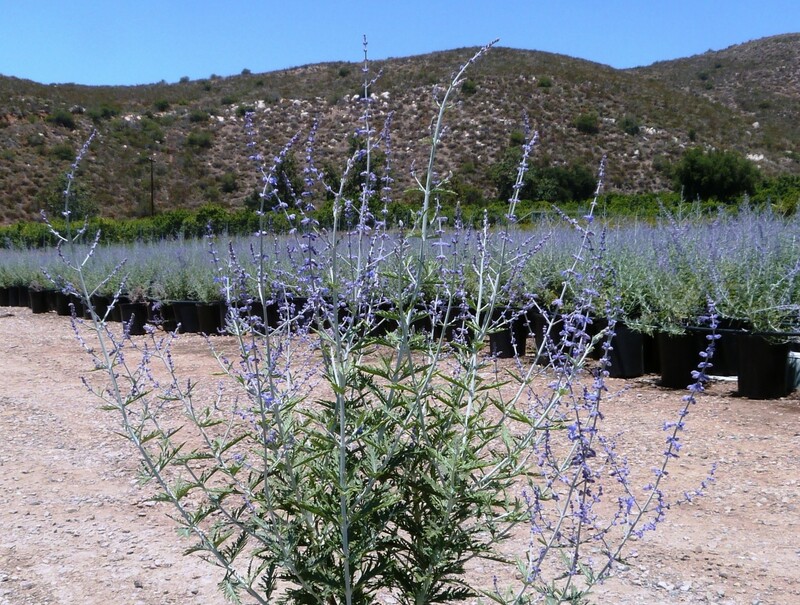 Though you can plant Russian sage in a variety of soil textures, it performs best in well-draining soils. Because it is fast-growing, pest and disease free, and very drought tolerant, Russian sage is an excellent choice for low maintenance landscapes. Deadhead spent flowers and seedheads to help prevent it from reseeding in favorable conditions. Russian sage can also spread due to adventitious root shoots. To encourage healthy, beautiful growth each spring, cut it back annually. With age, you may consider dividing Russian Sage to keep its size under control.